FAS has a Market Club report score of +60, much better than last week. There are rumors that details for the new toxic debt bailout plan could be released as early as Monday. Now fundamentally, I don't think it makes a difference of what details they unveil this week, because first of all, anything that is put into effect, we don't see the results from it until at least 3 months down the road. Second, I feel they are still very short on the amount needed to make a significant difference in the toxic debt market. However, history has shown us that investors can get revved up on rumor and speculation. Buy the rumor, sell the news. This toxic plan could be another trillion dollar plan announced over the podium at some point this week. Obama did refer to the plan a few weeks back, but failed to go into much detail of what it would consist of. I would expect some optimistic trading as a result of the rumors. At least for a day or two, maybe. Either way, I feel it will be short lived and cause more problems for the market down the road. This could be the news that could propel us into the high 7000's, before seeing some more serious selling. If that is the case, plan on me starting to pick up some short positions this week. I just wanted to give a quick update. 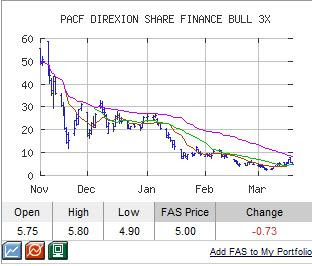 The FAS trend analysis above is looking pretty impressive for the time being, however, I'm not a buyer. Happy Trading. Just wondering if you think FAZ can go below the 20 level, being it just started to break below it's old 52 week low ? Do you look at chart analysis for support and resistance and if so we are at major resistance on S&P @ 800 and support at 741. If we don't break thru 666 then we could break the down trend. Thoughts are appreciated ? under 20 is a possibility for sure. But tech analysis is very very cloudy right now for the financial stocks since their is a huge outlier continuing to hang over them called govie intervention. But I believe, the faz demise will be short lived. It takes time to clean up a big mess.